Give your bathroom a makeover with your very own personalised shower curtain. Lovingly handmade using 100% waterproof fabric, design your own shower curtain available in three standard widths to suit your needs. Custom shower curtains are the perfect way to take your hot showers and steamy soaks to the next level. Every part of your home should reflect you and your personality, including very 'ordinary' items like the humble shower curtain. We offer 3 standard sizes that fit most showers and bathtubs. Printed with your photos, art or funky designs, bath-time will certainly become fun-time, especially for little ones who can be reluctant to get in the bath. We offer 3 standard sizes that fit most showers and bathtubs. Printed with your photos, art or funky designs, bath-time will certainly become fun-time, especially for little ones who can be reluctant to get in the bath. Great item and extra - super service ! Product turned out great, service was the best . Really recommend Bags of Love. Product quality is good so far. Service standards good and will order from here again. Who Would Love Custom Shower Curtains? Treat your friends to a totally original housewarming gift with luxury shower curtains designed by you. Perfect for families with traditional vintage bathtubs, these custom shower curtains get the perfect fit and prevent splashes of water ending up on the floor. They make a really nice gift for grandmas too who need to refresh their bathroom décor now they've got small grandchildren coming to visit. Any bathroom could benefit with personalised shower curtains to reflect the owner's personality. Your luxury shower curtains are handmade to order in London, UK, by our team of expert seamstresses. Using a specialist digital process, the print is deep, rich and long-lasting so it won't peel away or rub off. Care: Cool wash occasionally at 25°c. Rinse in the shower with daily use. Quick dry. Please note: On our large shower curtains, you'll notice a vertically stitched seam. This is where we have joined two sheets of fabric together to make the bigger width. We take this into consideration and try to position this seam in the best location for your individual design. For small long shower curtains, the width is narrower, so portrait images work best. Or you can use our Colour Picker to create a background for your image if it doesn't fit the length. Landscape images look great on the extra large shower curtains which have a bigger width to accommodate king size baths. Please bear in mind we use the edge of the material to create a hem, so keep important features of your photo away from the bleed area. For new parents, customise a shower curtain with photos of them cradling their new baby, or print a colourful design such as snakes and ladders to get invoke their curiosity. Turn your bathroom into a magical sanctuary with tropical rainforest photos. As you're washing your hair, you can imagine you're showering in an exotic waterfall surrounded by nature. 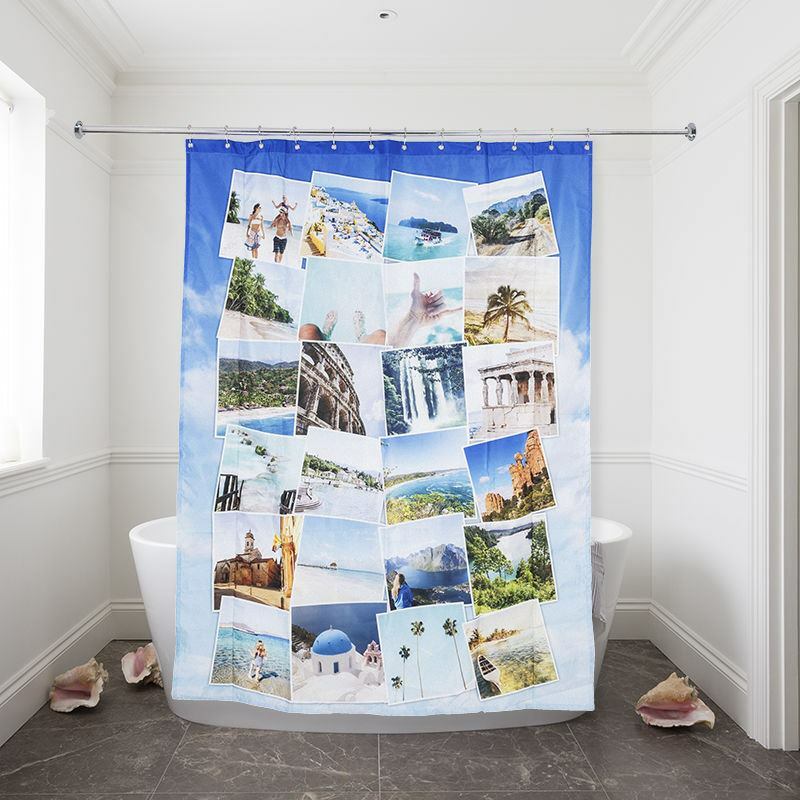 Travel back to your romantic honeymoon each time you take a candlelit bubble bath with a personalised shower curtain printed with a photo from the holiday. You can reminisce on your time together, helping you relax and unwind after a hard day.